Trinity Designs: Blog Awards on My Birthday! Wow, what a wonderful way to celebrate! I received two blog awards last week from my friend Tiffany! She is an amazing stamper and friend and you should definately check out her blog here. Thanks so much, girlfriend! 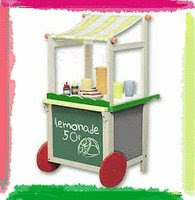 The rules of the award (To pick up the Lemonade Stand Award):- Comment on this blog.- Cut and paste the award logo and use it in your own blog.- Nominate 5 to 10 blogs you feel show great attitude and gratitude.- Link to your nominees within your blog post.- Comment on their blogs to let them know they've received the award.- Link back to the person who gave you the award to show your appreciation. My nominees for this award are: Kelly, Jaimie, Selene, Linda and Lisa! Thanks so much for inspiring me and for sharing yourself with us! 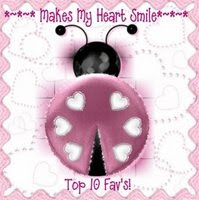 The Ladybug Award is for your blogging friends who make you smile, so for this one I nominate: Stacy (one of my new team members! ), Ashley, Sheryl, Tiffany and Patti. There are so many of my blogging friends who make me smile everyday and inspire me with their art. Stamping is such a wonderful creative hobby - it truly can be all things to all crafters! I am so glad you choose to visit my blog and I hope you come away inspired to pick up your stamps and create to your hearts content! Have a wonderful holiday Monday and if you didn't see my Memorial Day tribute on Friday, be sure to check out this post here. We are so blessed to live in this Free, Christian Nation and I thank God everyday for those men and women who gladly put themselves in harms way to protect our freedoms. May God bless them, their families and may he continue to bless America! Leave it to you to think of others on your birthday!!! So sweet for you to think of me! Big hugs!